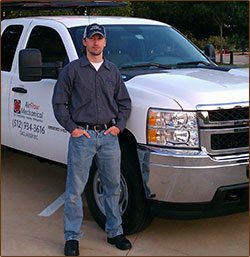 AirFlow Mechanical is an air conditioning company serving clients in Austin, Pflugerville, Round Rock, Georgetown, Buda, and Bastrop. We are fully licensed and certified to work on all models of air conditioning units. Having a properly working air conditioning unit helps to keep your electric bill low and temperatures at more comfortable levels. Our service department is available 24/7 to resolve any issues with your air conditioning system. Whether you are looking to have a new air conditioning unit or current one serviced we urge you to contact us at 512.934.3616. Our staff is standing by to answer any questions you may have and set up a no-cost consultation today.